As you can probably tell from my spotty posting performance over the past month (or six), I've gotten busy with other projects. I've let a lot of Haynesville material slip between the cracks (or pile up on my desk and computer). Instead of stockpiling it and waiting for time to make thoughtful comments on the material, I'm going to try to just put it out there without embellishment and force you, my faithful readers, do all the work. Sorry! In that spirit, here is the link to the recent EXCO quarterly slides. There's lots of good stuff about the Haynesville Shale. 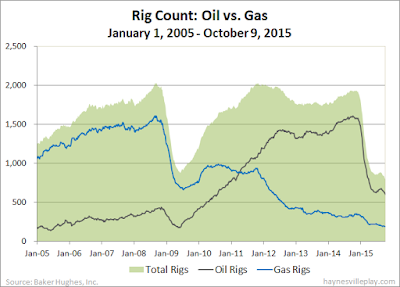 The Baker Hughes U.S. rig count was down 12 this week to 775. Oil rigs were down 16 to 578 and gas rigs were up four to 197. 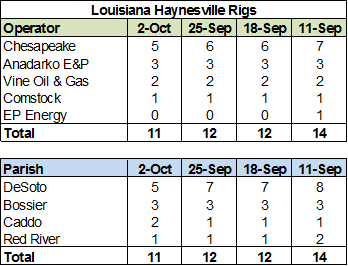 By type, horizontal rigs were down 14 to 577, vertical rigs were up three to 112 and directional rigs were down one to 86. Among gas rigs, horizontal rigs were up three to 146, directional rigs were down one to 34 and vertical rigs were up two to 17. 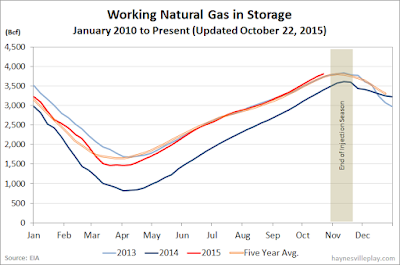 The EIA announced this morning that working gas in storage was up 81 Bcf to 3.814 Tcf. The weekly injection was 14% below last year (+94 Bcf) and 6% smaller than the five year average (+86 Bcf). The current storage level is now 12.8% higher than last year (3.38 Tcf, a difference of 434 Bcf) and 4.5% above the five year average (3.651 Tcf, a difference of 163 Bcf). Suddenly, the action shifts to Red River Parish! Last week the Haynesville Shale rig count was up two to 18. Louisiana was up two to 13, while Texas was unchanged at five. 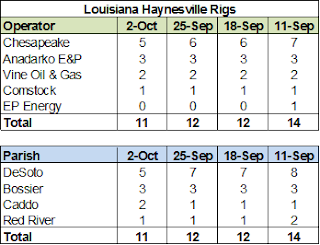 In Louisiana, Vine Oil & Gas was up from two to four rigs, all in Red River Parish, which now sports a grand total of five rigs (up from one last week), the highest count in the Haynesville Shale. This is exciting news because there is not really much excitement in the play, so sometimes we have to make our own fun! 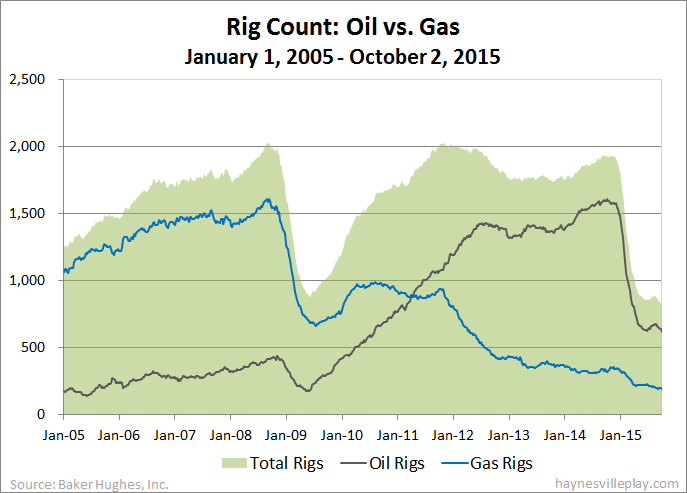 The Baker Hughes U.S. rig count was down 14 rigs this week to 795, the lowest level since May 2002. Oil rigs were down nine to 605, gas rigs were down six to 189 and miscellaneous rigs were up one to one. By type, horizontal rigs were down 11 to 598, vertical rigs were down three to 114 and directional rigs were unchanged at 83. Among gas rigs, horizontal rigs were down four to 143, directional rigs were down two to 32 and vertical rigs were unchanged at 14. It's the same old story: the weekly gas injection is a little below the same week last year but a little above the five year average. The EIA reported this morning that working gas in storage last week was up 95 Bcf to 3.633 Tcf. The weekly injection was 10% below last year (+106 Bcf) but 3% above the five year average (+92 Bcf). The current storage level is now 13.9% lower than last year (3.19 Tcf, a difference of 443 Bcf) but 4.5% higher than the five year average (3.478 Tcf, a difference of 155 Bcf). 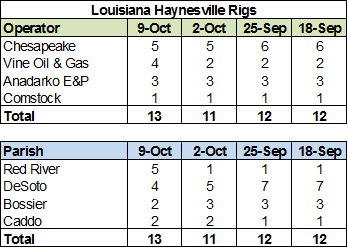 The Haynesville Shale rig count dropped again last week, losing one rig to end the week at 16. Louisiana was down one (Chesapeake) to 11, while Texas held at five. The U.S. rig count was down 29 this week to 809, as oil rigs dropped 26 to 614, gas rigs were down two to 195 and miscellaneous rigs were down one to zero. By type, horizontal rigs were down 20 to 609, vertical rigs were down six to 117 and directional rigs were down three to 83. Among gas rigs, horizontal rigs were up three to 147, vertical rigs were down five to 14 and directional rigs were unchanged at 34. 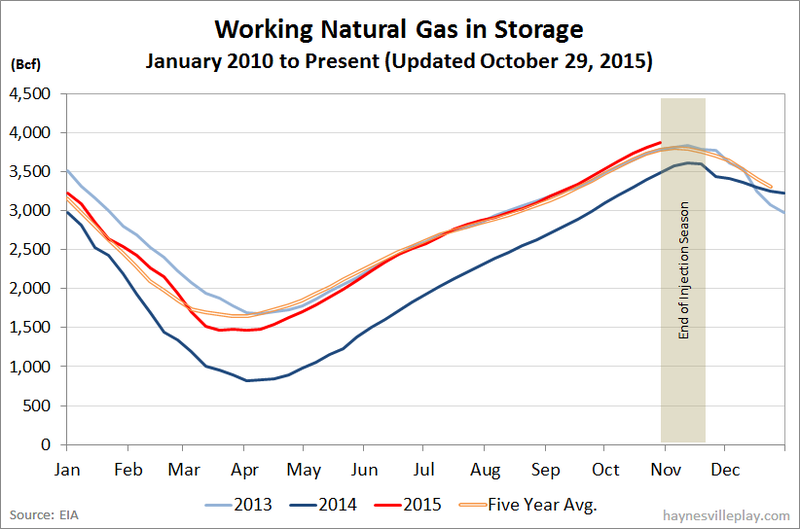 The EIA reported this morning that working gas in storage was up 98 Bcf to 3.538 Tcf. The weekly injection was 11% lower than last year (+110 Bcf) but 4% above the five year average (+94 Bcf). The current storage level is now 14.7% higher than last year (3.084 Tcf, a difference of 454 Bcf) and 4.5% above the five year average (3.386 Tcf, a difference of 152 Bcf).